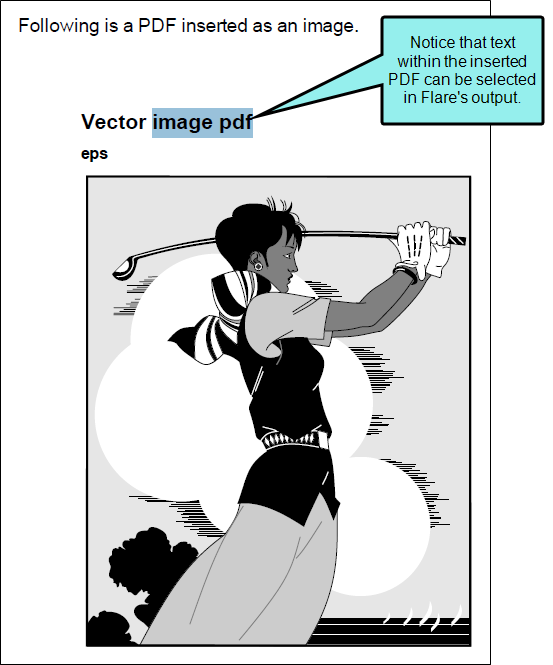 If you have tracked changes in Flare, you can preserve the changes so they are visible when you generate PDF output. You may want to use tracked changes in a PDF document for a number of reasons. The most common reason to use tracked changes is for internal review processes. 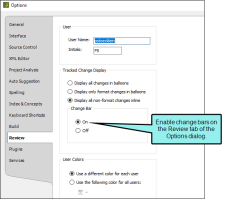 For example, if you have many reviewers who only review content occasionally, you may want to use tracked changes in PDF so the reviewers can use familiar software. This may help to speed up the review process. Another reason to preserve tracked changes in PDF is if you need the reader to see changes in a document. 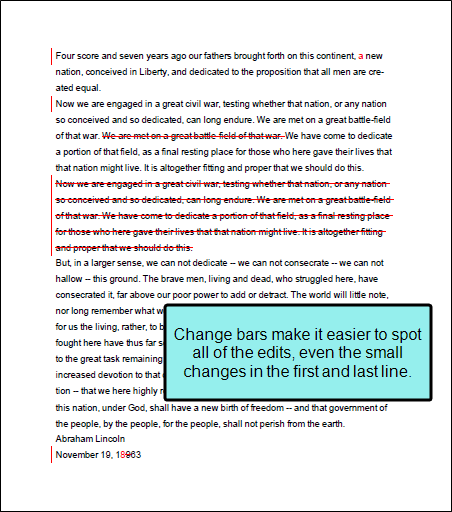 By preserving changes in PDF output (and by using change bars, if necessary), the reader can easily locate new material. 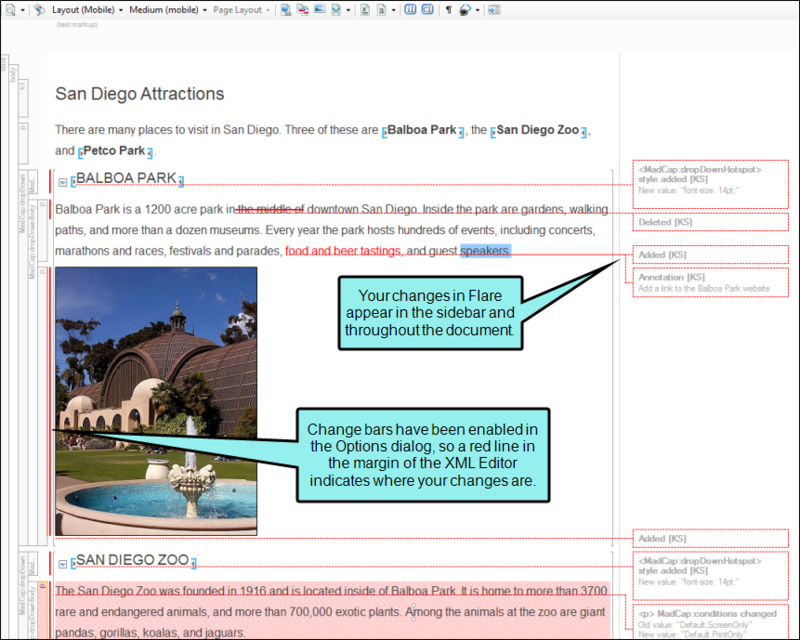 See Preserving Tracked Changes in PDF or Word Output. When you produce PDF output from Flare, the following changes are preserved. Note: Inserting or deleting a snippet tracks the entire snippet. Changes within a snippet are not reflected in the output. Note: Some changes are tracked using change bars. You can enable change bars in the Options dialog (Review > Review Options). See Changing the Display of Tracked Changes. Note: Tracked changes may not be visible in all PDF readers. Let's say you tracked changes in Flare. 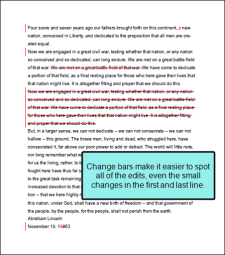 When you preserve track changes in a document, you can also use change bars to identify new, revised, or deleted text. 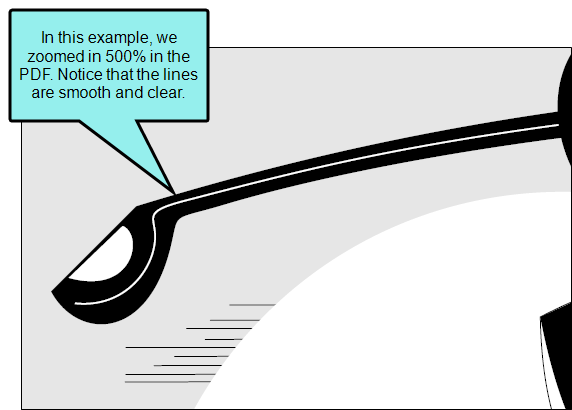 When change bars are enabled and a revision is made, a vertical line appears in the left margin. This visual cue alerts readers that there was a change in that line. Change bars appear in both the XML Editor and PDF outputs. You can enable change bars from the Review tab of the Options dialog (Review > Review Options). Change bars can be enabled in addition to other track changes options (e.g., balloons, inline markup). 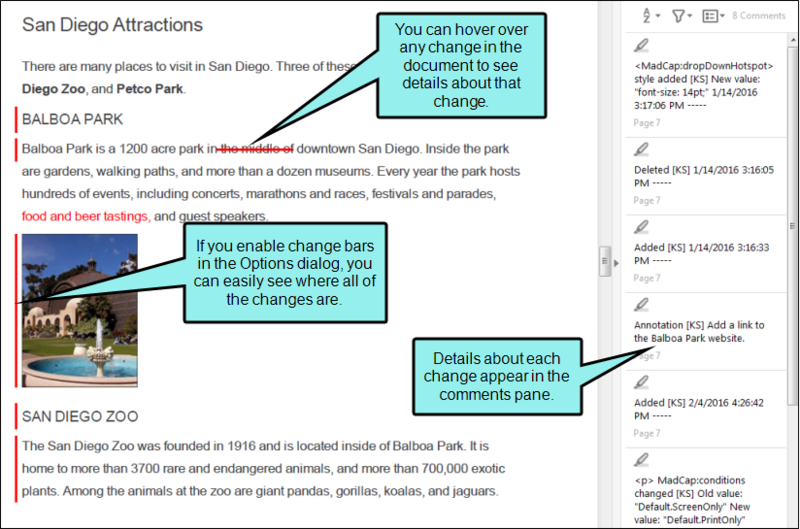 See Changing the Display of Tracked Changes. You are editing a document with track changes turned on. Some of your changes are very large (e.g., removed or added words), and others are small (e.g., fixed typos, changes to single words). Because all of the changes are important, you decide to turn on change bars. 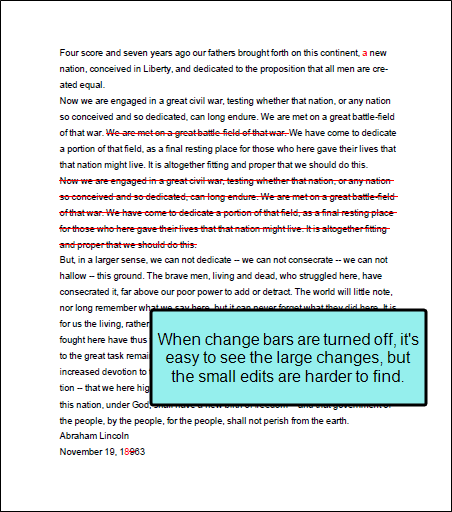 By enabling change bars, a red bar appears next to the paragraph whenever there is a change, regardless of whether it is a large change or a small change. 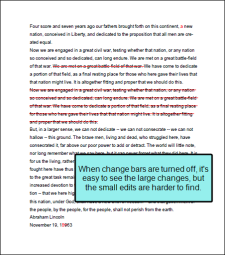 When you publish the PDF output with the changes preserved, readers can scan the document for change bars. When they see a change bar, they know to look in that paragraph for the change. This is much easier and faster than skimming the entire document searching for additions or deletions, at the risk of missing an important change. Note: In order to see tracked changes (including change bars), make sure you have chosen to preserve tracked changes in the output. 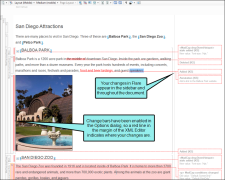 See Preserving Tracked Changes in PDF or Word Output. 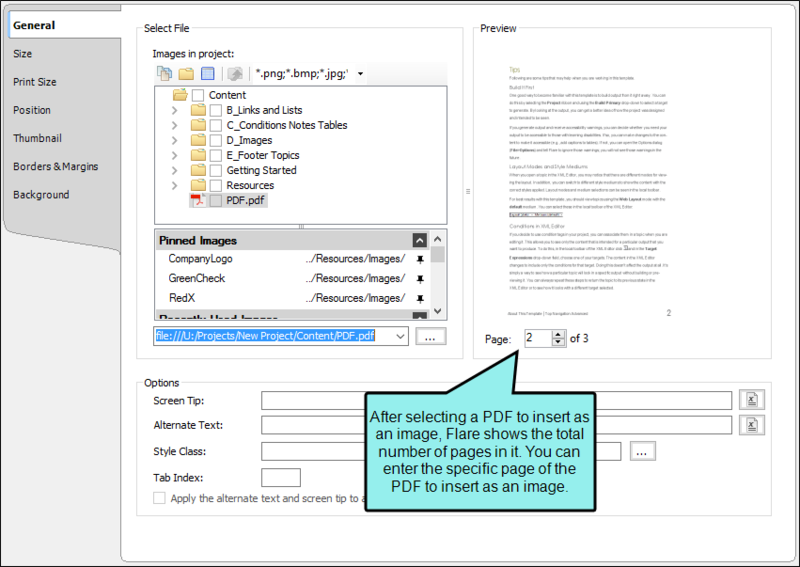 PDF output from Flare is designed to be accessible to users with disabilities. See About Accessibility. Images—Alternate Text HTML "alt" (alternate text) attributes are converted to the PDF equivalent during compilation so that screen readers have a way to describe the image. It is up to you to ensure that alt attributes are present on all images and descriptive enough to be useful to your end users. 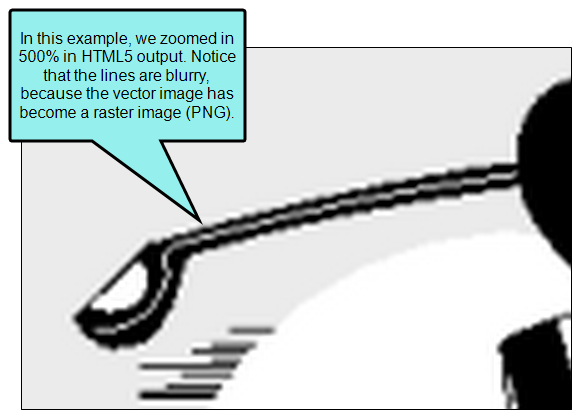 See Inserting Images and Editing Images. Language for Content XML "lang" attributes are converted to the PDF equivalent during compilation. This applies to both the project-level language (i.e., the language of the entire output document) and to element-level languages (i.e., languages applied to specific XHTML elements). This is an automatic process that occurs behind the scenes without user input. PDF Tagging You can select an option on the PDF Options tab of the Target Editor to generate a tagged PDF. This gives the file a structure similar to that of the source XHTML documents. This structure is necessary for certain accessibility applications, including screen readers. For more information about viewing the tag structure in Adobe Acrobat Pro, please refer to the documentation provided with that application. 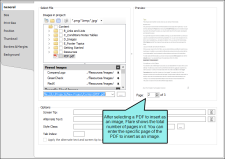 See Specifying PDF Options. Note: If you enable this feature, the size of the PDF output may increase somewhat. Compilation time should not be significantly affected. Tables—Header Cells Tables in PDF output are given a structure that designates which cells are header cells and which are content so that screen readers can translate the table data in a useful way. For more information about creating header cells in tables, see Inserting Tables and Editing Table Properties. Note: Some font families contain bold or italic variants (e.g., the font Georgia has a relative named "Georgia Bold" and another named "Georgia Italic"). If you are generating native Adobe PDF output, bold or italic formatting that is applied to text will display properly in the output ONLY if the font you are using already has a bold or italic font relative. You can determine the availability of such fonts by opening the Fonts folder from the Control Panel in Windows. For example, let's say you open the Fonts folder and see that, in addition to many other fonts, you have the following: Andalus, Angsana New, Angsana New Bold, Angsana New Bold Italic, and Angsana New Italic. If you use Andalus and apply bold or italic to some of the text, that content will not display in bold or italic in PDF output. However, if you use Angsana New and apply bold or italic to some of the text, that content will display in bold or italic in PDF output. The reason for this is that Andalus does not have a bold or italic relative, whereas the Angsana New font does. Note: You can link to PDF files outside of your project by simply creating an external link with absolute path. See Inserting Links to External Files—HTML, PDF, Microsoft Office. 1This is available in the Tripane output only. It is not available in Side or Top Navigation outputs. 1This refers to the use of the Responsive Layout window pane (Home > Responsive Layout) to create content that adjusts automatically, depending on the screen size. 2Responsive content is supported in Clean XHTML output only if you do not select the target option to convert styles to inline. Following are search features supported in each online output type.